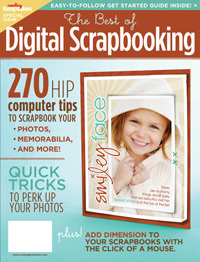 I wasn't all that surprised when the majority of you said that your were either all or primarily traditional scrapbookers in your comments from the giveaway post for a free copy of The Best of Digital Scrapbooking. We do love our paper, don't we!? I know I do! Regardless, digital still has its allure and even for those of us that still love the old-fashioned way, there are definite benefits of knowing how to use technology to improve your pages such as enhancing digital images, creating interesting journaling treatments in word and more. So, there really is something for everyone in this special issue from CK. This time, Random.org chose lucky number 27!! Congrats, Beth! Please watch your inbox for further details on how to claim your prize!